The crux first pitch of No Rock Nazis is technical, well-protected, and often overlooked. The second pitch starts with steep and hard-to-protect liebacking followed by a tightly bolted face climbing crux. 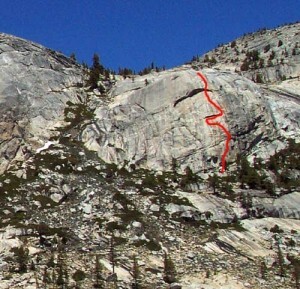 This route joins the Sting at the end of the second pitch. A linkup of No Rock Nazis to The Sting to Hoodwink (or the 5.10d crux mantel pitch of Rock Lobster) adds even more fun climbing. Which SuperTopo guidebooks include a topo for No Rock Nazis?